Boston’s organized homeless people continued their fightback against oppressive conditions in city shelters by mounting an unprecedented March of the Homeless on April 23. The march through city streets culminated in a united rally with the immigrant community at the Massachusetts State House. The march and rally continued the ongoing resistance to Boston’s Long Island shelter disaster of Oct. 8, when the city’s largest shelter was suddenly closed. With just four hours’ notice, 750 homeless residents, 300 of whom were residing in long- and short-term recovery programs, were ousted from the shelter. Marchers walked a three-mile route past major city shelters — Rosie’s Place, Woods-Mullen, Pine Street Inn, Bridge Over Troubled Waters and St. Francis — picking up homeless people along the way and from the streets. The march followed weeks of intensive outreach by the Boston Homeless Solidarity Committee, an organization of the homeless and their supporters. Along the way, organizers Cherai Mills, Cleve Rae and Jesse Maxwell — all currently homeless — made stirring speeches at each shelter the march passed. 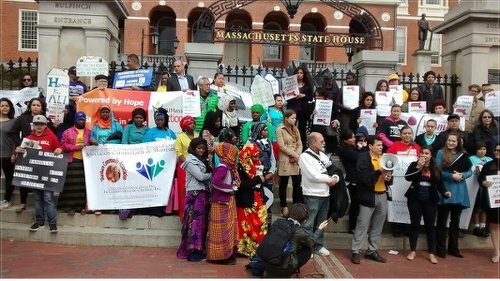 When marchers arrived at the State House steps, they united with a rally called by the Massachusetts Immigrant and Refugee Advocacy Coalition. MIRA was demonstrating against a proposed state law that would bar all so-called undocumented people from applying for public housing. The March of the Homeless was organized by the Boston Homeless Solidarity Committee with support from the Mass Alliance of HUD Tenants, the Women’s Fightback Network, the National People’s Power Assembly, Boston University medical students and many others.